At John Paul the Great Catholic University, we believe in the power of beauty to transform culture. 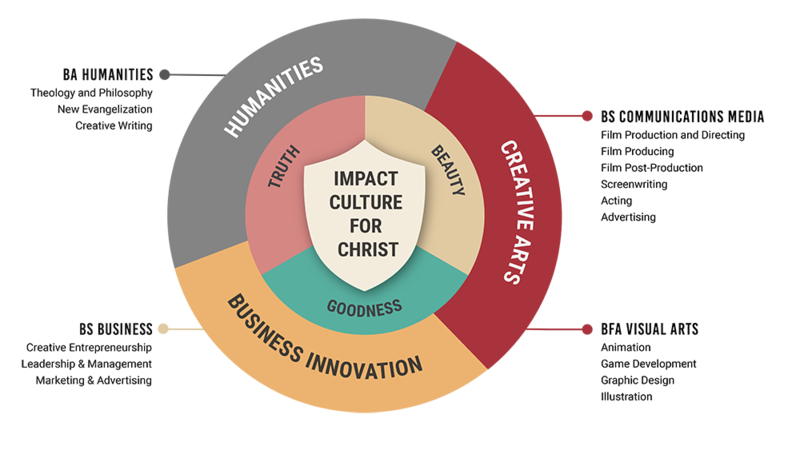 We're shaping the next generation of artists and innovators with academic excellence, unparalleled creativity, and an authentic community centered on Jesus Christ. Study your craft under seasoned industry professionals, and get critical internship and networking experience in our Los Angeles Quarter. Receive a deeply Catholic liberal arts education in Scripture, theology, philosophy, literature, art, and music appreciation. Develop your craft through our project-intensive coursework, and master state-of-the-art equipment in our production facilities and media lab. Live and grow in a Christ-centered community of creative students who are passionate about entertainment media and storytelling. Fill out the form below to receive a free viewbook on JPCatholic's programs. "Being part of JPCatholic has given me the opportunity to immerse myself in Catholic theology, while learning how to effectively teach it through relevant media, in the context of innovative business models… all on a campus where the Blessed Sacrament is available 24/7 and Confession and Mass are offered daily." "JPCatholic provided me with two fantastic things: a network of great, talented, driven friends and mentors, and classes that gave me some hard skills and the knowledge of how to organize and work creatively with people." "Going to JPCatholic was one of the best decisions I’ve made in my entire life – not only for the educational piece but also because of the people I encountered going there. They are my rocks, my support system, they are my family."